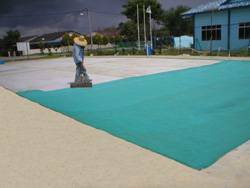 Photos showing the stages of preparation and installation of tennis courts using Fibre Mesh System to prevent existing concrete cracks from propagating to the top surface. 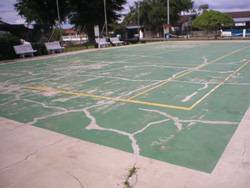 Step 1 - Patch up existing cracks on old concrete surface of tennis courts. 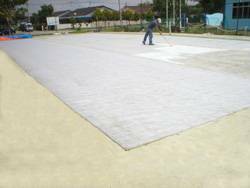 Step 2 - Apply a layer of coating on Fibre Mesh System that is laid on top of concrete surface. Step 3 - More layers of coating are applied. 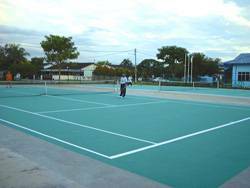 Step 4 - Tennis court coating is applied. 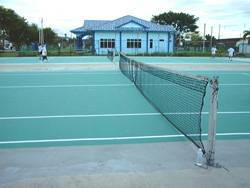 Step 5 - Tennis court lines are drawns. 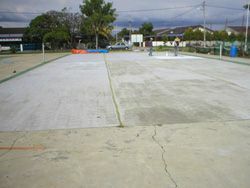 Step 6 - Completed tennis courts.